White College Grads Preferred Donald Trump? 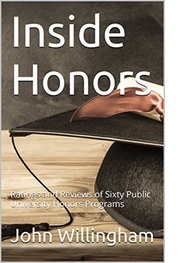 John Willingham is the founder of the website PublicUniversityHonors.Com and the author most recently of Inside Honors: Ratings and Reviews of Sixty Public University Honors Programs. He has an M.A. in history from the University of Texas at Austin. One of the many surprises in the recent presidential election was that most white college graduates voted for Donald Trump, disregarding obvious and repeated lies, incitements to violence, false equivalencies, blatant Russian interference, and overt racist and misogynistic behavior unseen for decades. Although more did vote Democratic than in 2012 and in slightly greater numbers than in 2008, the Republicans had well-qualified, credible candidates in those previous elections. So was the economy enough of a factor to offset the pile of negatives listed above, despite positive pre-election economic news? Change? The gridlock in DC is mostly the work of the party Trump now represents. So what were they thinking? A better question is, why didn’t more of them evaluate the abundant evidence of manipulation and make a more objective, reasoned choice? The late historian Richard Hofstadter has been cited often during this election cycle, usually for his 1964 essay, “The Paranoid Style in American Politics.” Just as relevant now is his book Anti-Intellectualism in American Life, which appeared in 1963. Many people might not know, however, that the book was the fourth and last in a series, begun in 1952, on the changing role of higher education in America. His greatest concern was that the democratization of higher education would lead to demands that it become increasingly vocational and utilitarian, to the detriment of disciplines that challenged students to think about the motives, causes, and the sometimes tragic consequences of human behavior. Those consequences he knew well, with World War Two in the recent past. Recent research shows that students majoring in highly structured tech and engineering disciplines are among the best prepared when they enter college, with superior logical aptitude; they receive high raw scores for critical thinking skills as seniors. But the scores are relatively lower once adjusted for the higher entrance test scores of these students, indicating that the courses of study have had minimal impact on critical thinking ability. Liberal arts disciplines often require reasoning that can sort through a welter of possible truths and distortions, often in flux—as in an election. The same research cited above shows that students in these disciplines have higher adjusted scores in critical thinking than raw scores, indicating the positive impact of their courses of study. Business majors, who receive a plurality of bachelor’s degrees, do not receive high raw scores or high adjusted scores. Nor do they enroll in many humanities courses. Even though liberal arts colleges are the fine gems of American higher education, they are sadly vulnerable now, as humanities majors decline. But our public universities have become the most critical intellectual battleground. For one thing, most Americans attend these institutions. For another, these universities are subjected to partisan political influence, much of it avowedly anti-intellectual. Right-wing governors who trumpet freedom but fear the freest exploration of ideas want compliant workers and entrepreneurs and unquestioning “patriots,” not graduates who will challenge their motives and judgment. As men of the Enlightenment, Jefferson and other prominent founders saw reason as our greatest natural power. Since their time, we have learned how tenuous that power can be.